We looked at the top 1 Electric Chainsaws and dug through the reviews from 17 of the most popular review sites including BestReviews, Pro Tool Reviews, Backyard Boss, The Consumer Guide, Outdoor Ideas, Best of Machinery, Top Reviews, Sawed Fish, Electric Chainsaw, All Saws, Yard Care Life, The Pro Cutter, Pick Best Chainsaw, ConsumerExpert.org, Tech Rater and more. Through this analysis, we've determined the best Electric Chainsaw you should buy. In our analysis of 135 expert reviews, the Greenworks Greenworks 16-Inch 40V Cordless Chainsaw placed 8th when we looked at the top 9 products in the category. For the full ranking, see below. A cordless model w/ long battery life. Capable of handling up to 100 cuts or several hours of use. Lightweight. One big deal about the GreenWorks 40V Chainsaw (model 20312) is that it uses a brushless motor. That means it’s an electronically commutated system that doesn’t lose efficiency due to the contact of brushes on the commutator (the rotating part) of the motor. Brushless motors run cooler as a result, and they’re typically quieter and produce less vibrations that can damage other electronic components over time. And, since there are no brushes, the motor has a longer life as well and virtually no maintenance needs over the lifetime of the tool. The 40-Volt G-Max series this saw belongs to has years of innovative technology behind its creation and is considered one of the best in the market. The battery is considered a quick charge, and the battery in this particular model gets up to 150 4×4 inch cuts complete before needing to be recharged. You also have an onboard battery life indicator, so you know exactly how much time you have left to work. For newer users doing light cutting, the 20312’s lightweight nature is preferable, and definitely not something users will regret. One of the nicest things about the saw is the fact that it’s quiet. Seriously. It’s actually quiet. And not just “quiet for a saw” – you can cut wood without ear protection, which is stunning. No emission, no fuel needed and quiet operation. This chain saw from GreenWorks comes with a battery that is compatible with other GreenWorks 40V Li-Ion tools. The motor on the saw is designed to deliver up to 30% more torque for better cutting performance and use in a wide range of sawing applications. The GreenWorks 20312 is a heavy duty worker as well as looking good. The cutting efficiency is very high (comparable to gas based models) and vibrations are reduced by as much as 70%.​ Ultimately this is a much less physical chainsaw to use than a comparable gasoline model. This model delivers smooth, clean cuts, a long chain life, and a new attitude about battery-powered, cordless chainsaws. Featuring brushless motor technology that extends the efficiency and life of the motor, external chain tensioning, an automatic oiling system, and up to 70% less vibration with its ion-lithium technology. The 20312 offers the same flexibility in that users do not have to be close to a power source. This would therefore make it useful for taking on camping trips to cut some firewood, for example. Battery-powered chainsaws give its users freedom to move around venture farther away than previous iterations of the electric chainsaws fitted with cords. These chainsaws are extremely easy to start. They are reasonably easy to handle and light in weight and there are no cords to worry about since the saws aren’t corded. No pull cords, no maintenance, and no gas required. It has a brushless motor, which means it requires almost no maintenance and it is virtually silent and without any vibration. Brushless motors will typically last a lot longer than a standard electric motor which is great to see in this model. This motor provides 30% more torque, and it will do 100 cuts on a single charge. With its design features, a low kickback chain bar as well as a chain brake for added safety when cutting a stubborn tree limb. The bar is also not too long to make it hard to control. It is stable and easy to maneuver, especially for arborists. Just like typical chainsaws, the Greenworks 20312 also features safety features that prevent it from harming you. Designed with self-lubricating mechanism, this is one of the most quiet chainsaws on the market. In addition to this, it vibrates very little during use. It uses the most impressive 16-inch steel bar and chain, handguard, trigger, chain brake, and many other silent safety features. This intelligent chainsaw goes inactive if no activity is detected within few minutes. In my personal view, this device is the best chainsaw under short budget. Somewhat pricey. A few reports of quality control issues and of "lemons." Not quite as powerful as corded models. Oil may drain out when in storage and this saw may not work reliably after a few years of regular use. Tension knob is plastic and may wear down after continued use. Also, battery will deplete quickly when cutting large or hard pieces of timber. This extra performance comes at a cost - not just in dollars (usually over double the price of our first choice), but also in weight - at 10.3lb this chainsaw is around 50% heavier than the LCS1020. Oil leakage when in storage and care needed to ensure proper chain tension maintained at all times. 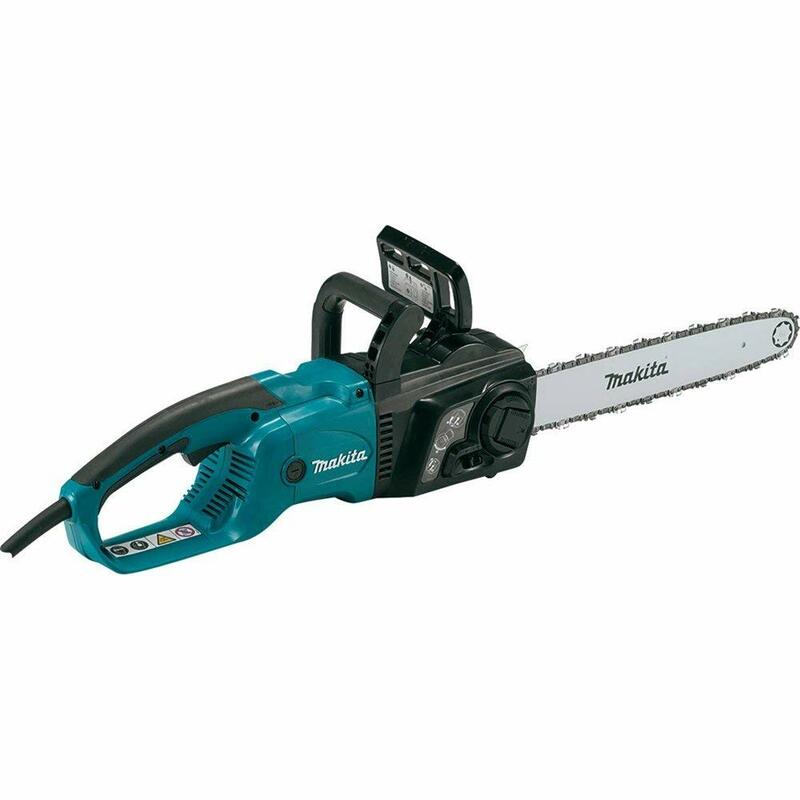 This product is still considered a lightweight compared to the more industrial gas-powered chainsaw. This limits the GreenWorks in some ways, to less intensive woodcutting work. They require quality care for the chain tension to be maintained and the oil leaks when the saws stored. The chain oiling system has a poorly-designed plastic micro-oiling pump and too much bar oil leakage for our liking. Thin blade increases sharpening frequency. Attractive for kids due to glowing colours.